A Strongly Connected Component (SCC) in a graph is a maximal subgraph such that all its components are strongly connected. Each SCC can either a single node or a set of	intertwined cycles of the original graph. The SCC graph is a derived graph in which each node represent one of the SCC of the original graph. This acyclic graph provides a simplified representation of the organisation of the original graph. This graph is thus often much more compact. In GINsim, the graph of the Strongly Connected Components (SCC graph) is often used to provide a better understanding of the organisation of the attractors in a State Transition Graph. The computation of the SCC graph can be launched through the Construct SCC graph option of the Tools menu. Note that GINsim also provides Hierarchical Transition Graphs dedicated to this problem. Example of Strongly Connected Component Graph (bottom right) and the corresponding state transition graph (top left). The Selection Attribute tab in the bottom panel shows the content of the selected SCC (i.e. the list of nodes in the original graph). Note that while the Construct SCC Graph tool is often applied to State Transition Graphs, it can also be applied to Regulatory Graphs (or more formally to any type of graphs). After computing the SCC graph, another tool enables to recover the subgraph of the original graph corresponding to the selected nodes in the SCC graph. 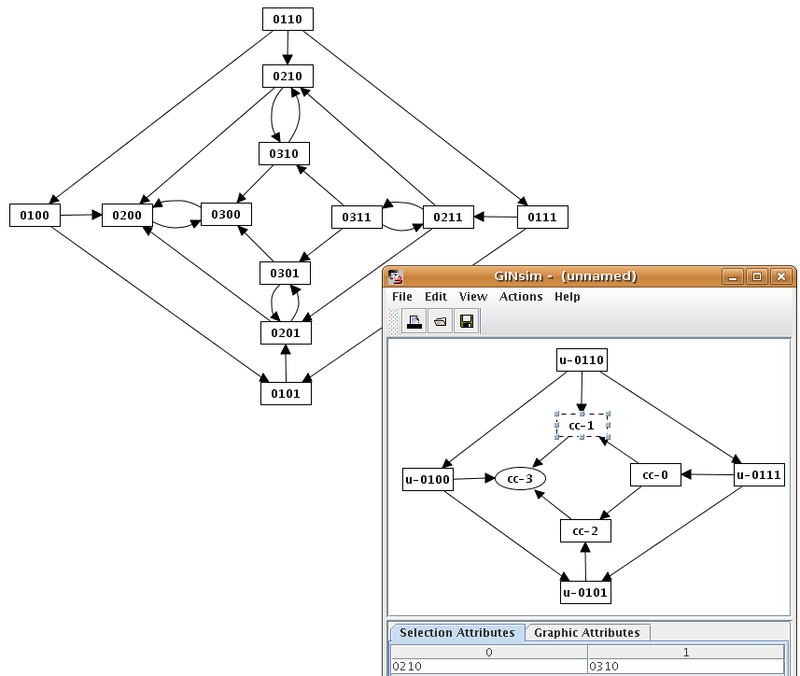 To use it, select some nodes in a SCC graph and run the Extract subgraph action from the Graph menu. This tool will open the original graph, and apply a filter to only keep the selected parts. To work properly it thus requires that the original graph had been saved to a file, and that the association between the SCC graph and the original graph (maintained by GINsim transparently) is still valid.